Feature: COM 2KR and NAV 2KR - VAL Avionics LTD. Remote units from Val Avionics bring something new to the panel — by taking something out. 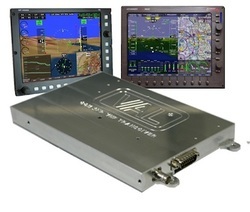 VAL Avionics, a leader in affordable, high-quality avionics, introduces the COM 2KR and NAV 2KR. Described as the next step in general aviation communications, these innovative radios are the first to offer complete integration with the electronic flight instrument system (EFIS) display via the RS-232 interface. The COM 2KR provides full control of transmit and receive frequencies as well as volume and squelch from the EFIS, allowing the COM radio to be removed from the panel, while the NAV achieves the same goal with receive frequencies as well as volume and OBS controlled through the EFIS. In addition to full user interface through the EFIS, remote units from VAL Avionics feature a compact design that minimizes space requirements while optimizing efficiency. Simplifying the panel with central command, both the NAV 2KR and COM 2KR are less than one inch thick and can be mounted almost anywhere within the cabin, freeing pilots to enjoy increased control and efficiency in their EFIS displays. As with all VAL Avionics products, the NAV 2KR and COM 2KR are crafted from milled billet aluminum for maximum durability and performance for years to come. Priced at $1,195 each, the NAV 2KR and COM 2KR offer the features of comparable products at a price that makes innovation affordable. Supporting both 14- and 28-volt systems, both the NAV 2KR and COM 2KR are outfitted for flexible installation in light-sport and experimental aircraft. To learn more, visit the COM 2KR and NAV 2KR product pages. For ordering information, call (800) 255-1511.